Home » Posts Tagged "HB 2353"
Today the House approved HB 2104, the bill moving local elections including school board elections to November of odd numbered years. The elections would remain non-partisan. The bill originated as an attempt to put local elections on the same calendar as state and federal elections – November of even numbered years – and to make those races partisan. Candidates for city commissions, school boards and other local offices would have had to file by party and participate in the August primary elections. Senator Mitch Holmes (R-St. John), when announcing the bill early in the session, indicated that it would be a way to wrest power away from the KNEA. Holmes believes that teachers voting in low turn-out races means the union controls the school board. This argument was raised on the House floor today by Rep. Kiegerl (R-Olathe). The Senate today debated Senate Sub for HB 2353, a bill that provides for some clean-up of issues in the block grant bill, SB 7. Clean-up language was needed for some issues over virtual schools (out-of-state students were being funded) as well as changes to a few other funds. An amendment was offered by Senator Abrams (R-Arkansas City) that would put changes to the professional negotiations act into the bill. Abrams moved to add the bill passed earlier by the Senate that reflects the agreement reached by KNEA, KASB, USA/KS, and KSSA. Under this provision, beginning next year associations and school boards would bargain salaries and hours every year and each side would be able to pick up to three additional items from the current list of negotiable items. All other items could be negotiated by mutual agreement. The amendment also changes the notice date to March 31 and the impasse date to July 31. 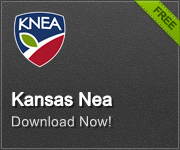 KNEA supports the amendment and the bill. It now goes to the House for a vote to concur or non-concur. The House may not amend the bill further. The budget conference committee (House Appropriations and Senate Ways and Means) continues to meet and will be doing so late today. At an earlier meeting today, the stalemate over funding the gap in the 20 mill property tax levy for schools (see yesterday’s report) may have broken. The new plan is to fund the $17.5 million for FY 2016 and wait to decide on the $13 million for FY 2017 until new revenue numbers come in. Senate Sub for HB 2109, the tax bill that came out of the Senate Tax Committee and was based on a proposal from Senator Donovan (R-Wichita), had been scheduled for debate today but was pulled at the last minute by leadership. There could be many reasons for this; perhaps there were not enough votes to pass it, perhaps amendments were being drawn up. Word is the bill will be back on the calendar for debate next Wednesday. The House Tax Committee is expected to continue work next Tuesday in an attempt to craft a bill for their chamber to consider. Both chambers have adjourned for the holiday weekend and will be returning to Topeka on Tuesday of next week. They won’t be paid for those days for those of you following the overtime spending. This would be a great weekend to connect with your legislators and urge them to get moving on resolving the state’s revenue crisis and funding our schools.